Owen Wilson is hysterical as Dignan. 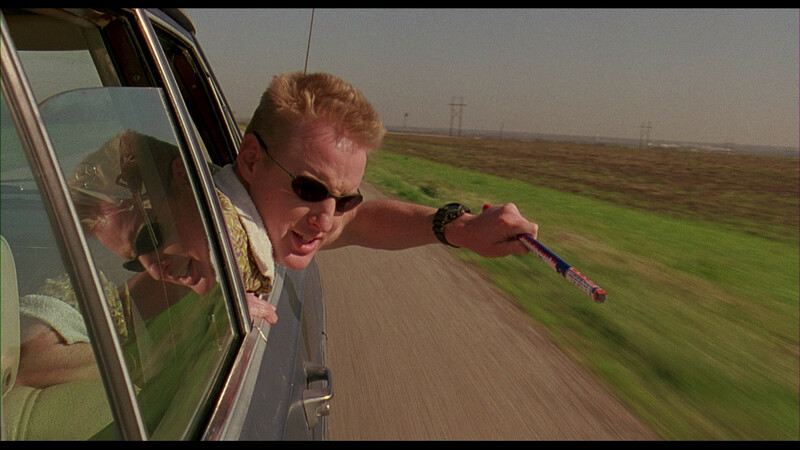 What an original and endearing little gem Bottle Rocket is. It doesn’t follow any formulas and kicks any possible cliches to the curb. For starters, Bottle Rocket isn’t orthodox about anything that it does. What about the plot? Well, the plot is there, but only sometimes. It concerns three hooligans aspiring to become master thieves. Their leader, Dignan (played by Owen Wilson), isn’t exactly smart and doesn’t really know what he’s doing half of the time, but he’s positive and stays positive so it’s impossible not to like him. His friends Anthony (Luke Wilson) and Bob (Robert Musgrave) are ne’er-do-wells as well. The trio executes their first crime at a local bookstore. They get a small sum of money and decide to go on the lam. Normally, going on the lam is when you’re forced to, as in you’re wanted by the police. The trio of hoodlums do it less because they’re forced to and more because they want to. They settle down at a motel, where Anthony falls in love with a Spanish-speaking maid. From here, Bottle Rocket meanders down several different paths, with none of them ever really leading anywhere. Wes Anderson, the writer and director here, shows us some of the most subtle humor you’ll see in a comedy. You don’t really laugh until a few seconds after the joke is said. This is the kind of movie that stands out amongst others, for it is very unlike other movies. The main problem though is that comedy comes only in certain scenes. The beginning of the movie is hilarious, as is the ending, but the middle is boring. These are the scenes where Anthony begins to grow feelings for the maid, Inez (Lumi Cavazos). It’s slow and not particularly interesting. Really, the scenes where a crime is perpetrated, those are the best. Anderson delivers just the right amount of idiocy to make less stupid and more funny. A standout performance is the one from Owen Wilson, playing Dignan. Wilson brings such a level of humor to this role that you just grin at every single action he does or word he says. It’s a fantastic comedic performance and such a likable character. Ashton Kutcher and Cameron Diaz look like a couple of fools in "What Happens in Vegas." I’m beginning wonder if there’s even an attempt made to make good movies anymore. It seems like the same exact thing keeps getting tossed up onto that silver screen, nary a change ever being made to the good ol’ rom-com formula. The creators behind What Happens in Vegas never even almost try to bring something new to the table, relying on clichés so overused and worn-out they wouldn’t even make for a serviceable boxing bag. Leading a cast of losers are the two of the unfunniest people Hollywood has ever had the indecency to bless with acting careers: Ashton Kutcher and Cameron Diaz. The days where good looks and charm compensated for raw acting talent have long since passed for the two of them and here they just look like fools, most notably in a scene where Diaz pegs Kutcher with oranges as they race through the streets of New York City, all-the-while looking like fools. Out of everything that What Happens in Vegas to offer, the story is the most original, even though saying that is a stretch. It deals with Joy (Diaz) and Jack (Kutcher), two radically different people whose troubled lives lead them to Las Vegas for solace. Joy has experienced a recent breakup, while Jack has been fired from his job. In Vegas, the two coincidentally cross paths and become friends. Eventually, they start drinking and soon find themselves married. Well, the following morning, the two realize that what they did was a huge mistake and immediately reconcile to get a divorce. But just as they are about to, Jack decides to play one final round on one of the slot machines and ends up winning the three-million dollar jackpot, thus resulting in their divorce being put on standby. This is where What Happens in Vegas loses any semblance of the charm it barely had and becomes a fight between Diaz and Kutcher for the title of who looks the stupidest at doing what. But to be fair, the audience this film was made for aren’t the kinds of people that like variety. They like seeing the same things done over again and again because it eliminates thought process. They don’t have to think about what’s coming next — they anticipate it. God forbid a movie that requires you to use your brain. I won’t go much further in explaining all the faults that What Happens in Vegas has. It would take too long and frankly, I’m tired. You’ll know if this is your kind of movie or not. What use is this review anyway? I’m basically just pointing out the obvious.